Who is behind this page? 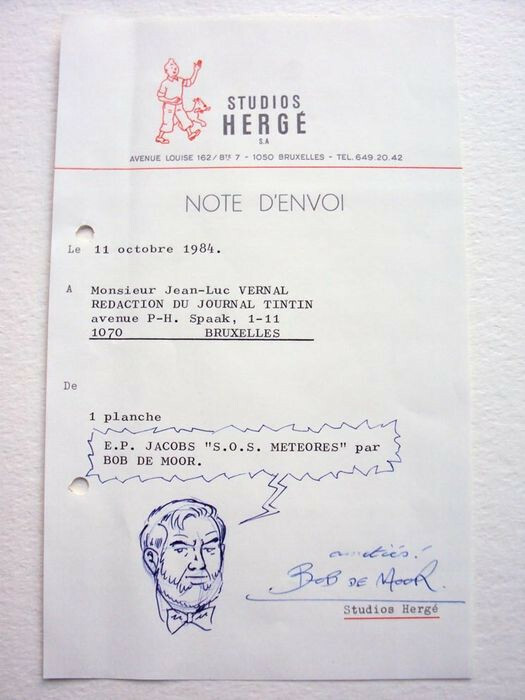 Today we present you a document which Bob De Moor sent to the editorial staff of the Journal Tintin, more precisely to Jean-Luc Vernal, the editor in chief of the Journal Tintin from 1979 to 1988, and which has been sold on Catawiki recently. We also have a rare interview with Bob De Moor which Régric (comic author behind Lefranc, Été indien pour la Mini, …) pointed out to us. 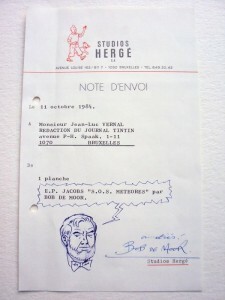 The note dating from 1984 with Mortimer as drawn by Bob De Moor. But first the document, it’s dated October 11 1984 and handles the shipping of a plate called “S.O.S. Météores”, but contrarily to what the seller on Catawiki implied, it’s not about a page from the Blake & Mortimer album “S.O.S. 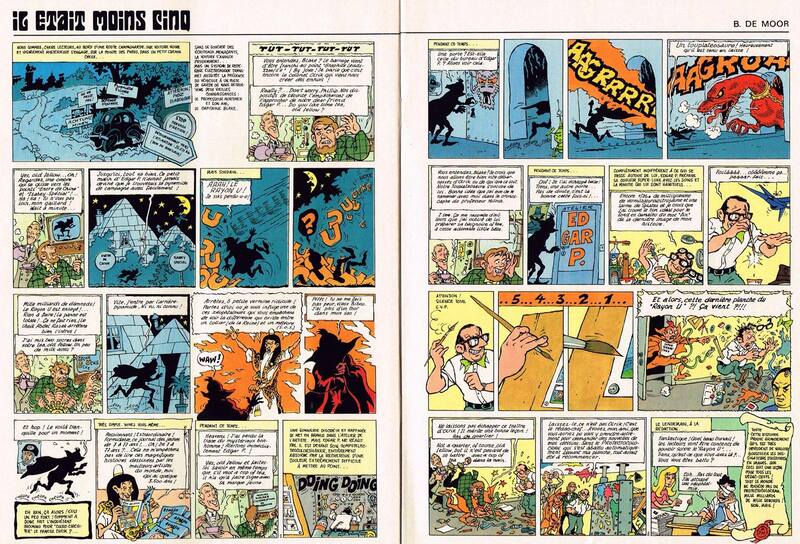 Météores”, but the very funny pastiche Bob De Moor made in 1978 and which was published in the Journal Tintin nr 49. The most important detail on this sheet of paper is however the head of Mortimer which Bob De Moor drew on the paper using a simple pen. 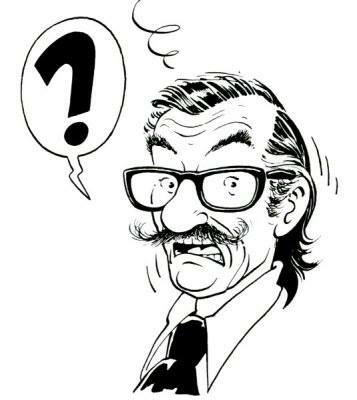 It would take until 1987 for Bob De Moor to draw the Edgar P. Jacobs characters again, namely for the “Mystère à Montreuil : Une enquête de Blake et Mortimer”. Next is a 50 minute (!) interview which Bob De Moor gave on April 11th 1990 to France Culture. This interview is quite worth checking out, although it’s in French and thus not for everybody understandable. But on the other hand it’s a very good possibility to hear Bob De Moor’s voice again, crystal clear this time. In the interview Bob De Moor discusses in detail “Les 3 Formules du professeur Satō – Mortimer contre Mortimer” (which had been released just a few weeks before), the censorship Jacobs had to undergo in France, the spies in the life of Jacobs, the absence of women in the work of Jacobs and Hergé, Hergé asking to add the Johan & Stephan album “Le renard qui louche” in the Journal Tintin, … and so on. Bob De Moor also talks about co-signing the album and… you can hear Bob De Moor sing à la Edgar P. Jacobs! You’ll have to take the rather hoity-toity Andy Warhol / René Magritte chitchat by some of the other studio guest for granted but each time Bob De Moor quickly brings the listener back to the real thing: the art of comics. Recommended listening! Bob De Moor has done more filmposters than the one for Robbe De Hert‘s “Janssen and Janssens” in 1989. 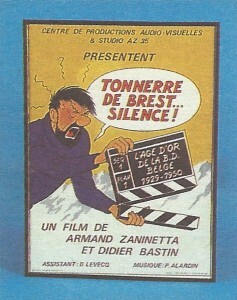 5 years earlier, in 1984, he made the filmposter for “Tonnerre De Brest, Silence! – L’âge d’or de la BD Belge 1929-1950”. 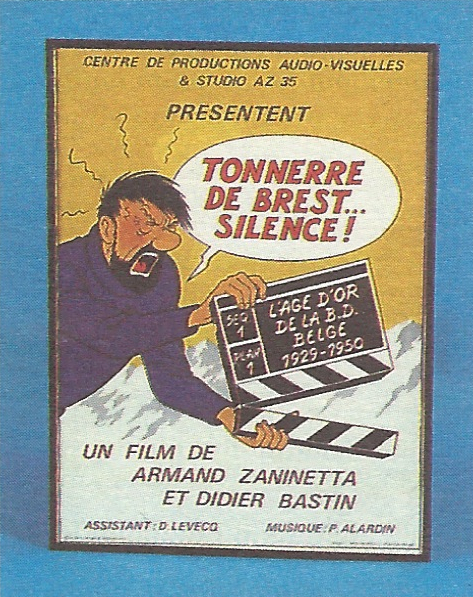 The belgian film, directed by Armand Zaninetta and Didier Bastien, was 98 minutes in length and featured such comic authors as Franquin, Jacobs, Morris, Roba, Peyo, Cirius, Eddy Paape next to the (not so famous) actors as Tanguy Foglia, Paul-Henri Burton and Luc Habets. The film itself was produced by the Brussels based Centre de Produdictions Audio-visuelles Studio AZ 35. The poster you see here was completed by Bob De Moor after Hergé‘s Captain Haddock character. Notice the rock formations in the background. There’s an anecdote to this film. When the film was premiered at the City 2 in Brussels, Edgar P. Jacobs arrived (together with De Moor) with a gun in his pocket. Jacobs had heard that the police had arrested drug pushers in the area a few weeks earlier and decided it was safer having a gun on him… “just in case they attack us” so he told Bob De Moor. Bob de Moor paid more than once tribute to Edgar P Jacobs‘ Blake et Mortimer. Here’s a brilliant double page from the Tintin Journal.